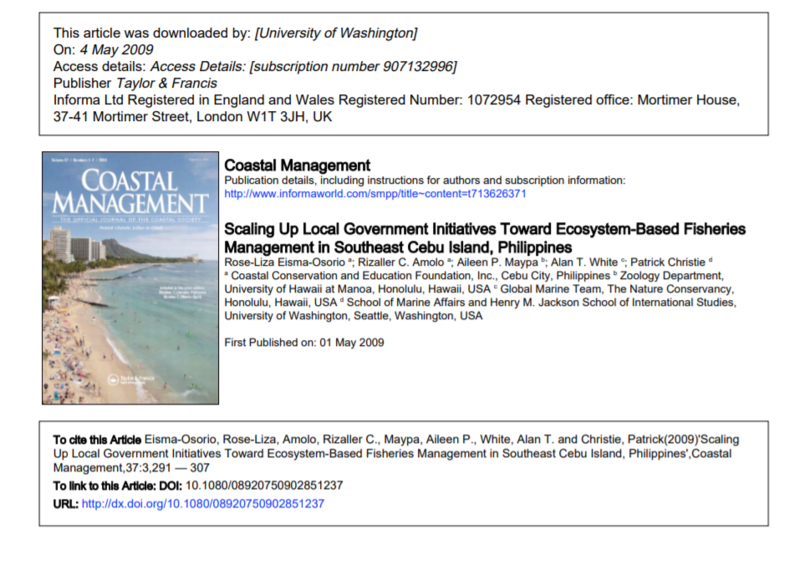 Abstract The Philippines adopts a highly decentralized approach to coastal management. Each municipal authority exercises management powers and responsibilities over their 15-km municipal waters. Nevertheless, in some areas like Southeast Cebu in Central Philippines, coastal resource management practices of a single municipality have been working toward scaling up the geographic scope to achieve the desired results of ecosystem-based management by expanding from a single municipality to a much broader collaboration at the intermunicipal scale. Such cooperative undertakings focus on activities that jointly address the major resource threats in each of the municipal jurisdictions, such as degradation of key coastal habitats, overfishing, and dwindling fish stocks. This article presents the management strategies, outcomes, and lessons of an intermunicipal collaboration that is starting to work and shows that local governance systems can be expanded to address the conservation needs of a broader ecosystem and scale.